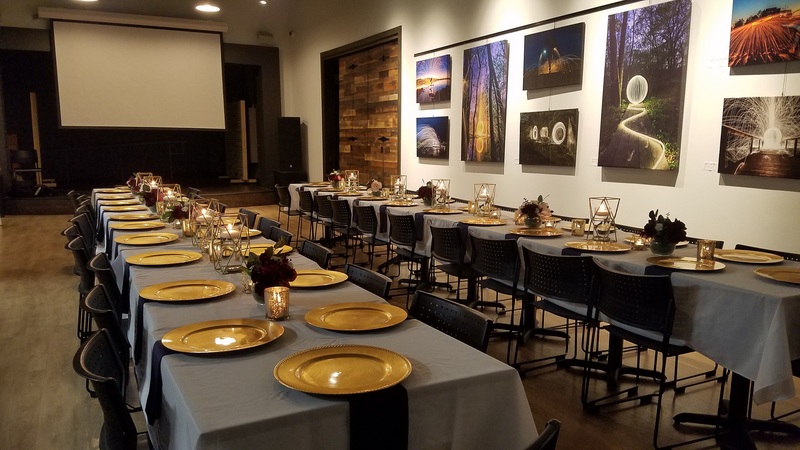 Hold your next event at Groundswell. Enjoy our open, modern space in the up-and-coming Kingston Village neighborhood just west of downtown. You can choose from our cafe space, the large coworking space next door to the cafe, or open the divider wall and use both spaces. All of the furniture is easily movable, so we can modify the space to fit just about any kind of event. Cafe: To rent the cafe space for private event, you’ll pay a $30 non-refundable reservation fee, plus $60 per hour (2-hour minimum). To rent the space for a concert or other performance where you’re charging for tickets, you’ll pay a $30 non-refundable reservation fee, plus 50 percent of profits from admittance/tickets to your event. Coworking Space: To rent our large event space, you’ll pay a $75 non-refundable reservation fee, plus $150 per hour (2-hour minimum). Both Cafe and Coworking Space: To rent both the cafe and the large event space next door, you’ll pay a $100 non-refundable reservation fee, plus $200 per hour (2-hour minimum). For Saturday events, to have the space for the entire day, you’ll pay $1,200 in May-October or $800 in November-April.